Compatible with Analog and Digital Displays: Digital converter box is tremendously important product for analog TV and VCR owners, which converts over-the-air channels for viewing on analog TVs (antennas not included). Real-time and Programmed Time Recording: Viewers can pause, fast-forward, rewind live TV, or record live programming with the electronic programming guide. The built-in USB port allows you record TV via a flash drive or external drive. (Support USB flash stick-Max. 64GB, and hard stick-Max. 1TB, only support FAT32 or NTFS). USB Multimedia Playback: View images and play back TV or to play your own music, video or movies from a USB device for an expanded experience. The device includes an emergency alert system to alert viewers to any emergency information broadcast by TV stations in their area. Additional Features: Pause Live TV, Parental Controls, Program Guides, Favorite Channel Listings, USB Multimedia Player, Auto Power Settings, Recording PVR, Closed Captioning, and Auto & Manual Scanning. What You Receive: 1 x Digital TV Converter Box/1 x Remote Control/2 x AAA Batteries/1 x Composite Cables/1 x HDMI Cable/1 x DC Adapter/1 x Instruction Manual, 30-day full refund, and 12-month warranty with friendly customer service. 1byone ATSC Digital TV Converter Box is a digital converter box that converts over-the-air ATSC digital broadcasts for playback on your analog or high definition TV. 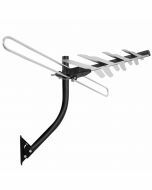 Working in combination with an indoor/outdoor antenna, enjoy all your local broadcasts from ABC, NBC, CBS, FOX, PBS, and other local networks completely free of charge. Great programming for kids, and news, sports, sitcoms or more for the entire family Without Any Cost. Imagine Never Paying a Monthly Cable or Satellite Bill Again to Enjoy your Favorite Shows! Please Note: This converter box is designed for converting OTA signals and cannot replace a cable box. 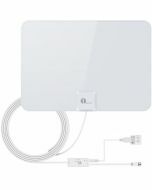 A connected external antenna is required for this converter box to receive broadcast signals. This converter box will not work with Comcast, DIRECTV, DISH Network, or similar offerings. This converter box is not compatible with encrypted cable signals. 1byone Converter Box allows for the live, instant recording of TV programs for later viewing. Recordings can also be scheduled for a later time so you never miss your favorite show even when out of the house. Recordings can be saved to a USB flash drive or external hard disk. Note: Due to buffer speed requirements, some USB flash drives may not be compatible with the box’s Timeshift function (which allows for the pausing of live TV). Please choose a compatible USB 2.0 and up flash drive or external hard drive. Converter box supports external 2.5” HDDs in FAT32 file format and 3.5” HDDs in NTFS/FAT32 file format, with a maximum hard drive capacity of 3TB. 1. Connected to the TV by RF Out Cable. 2. Connected to the TV by Audio L/R and Video Cable (AV Cable). 3. Connected to the TV by HDMI Cable. Parental Controls and EAS (Emergency Alert System). 1byone Converter Box lets you watch all your local news, weather and sitcoms, along with great kids, sports and educational programing at absolutely no monthly cost. Playback all your music, videos, movies and recorded TV programs with 1byone Converter Box via a USB drive. 1byone Converter Box supports HDTVs, LED TVs, and even traditional tube TVs. What is the best usb external storage device to use with this tuner in order to record live tv? I mainly want it to record live football games. A 3 1/2 hour game could fill 24 gigabytes of space, so you should get a flash drive that's at least 32 GB or buy a USB hard drive. I recommend the hard drive because it holds more shows and it's faster. USB 2.0 Flash drives can be too slow for some High Definition TV channels. USB 3.0 flash drives are so expensive that you might as well buy an external hard drive instead. Will this work strictly with antenna in and then hdmi out? I have an indoor antenna, a usb drive of 80GB, an hdmi cable, and a samsung smart tv. 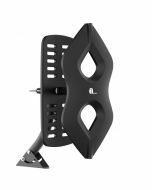 You can use the RF Cable to connect Antenna and the Converter Box, HDMI cable to connect your TV and the ATSC Converter Box. Why won't a future program record when I "book" the channel for recording? How I got the device to record. There may be a better way, but you won't find out by reading the manual. 5-Make sure "Timer Service"'says "Record" rather than "Channel." The default on my device said "Channel." For me, toggling to "Record" allowed me to "book" the recording. I had skipped this menu choice because it was meaningless to me, and the 1byone tech support didn't highlight this important step in their lousy answers to frustrated buyers. 12-Back out of set up by pushing the menu button multiple times until the tv signal is displayed on the page. 3-Press the ok button to play the program. 3-Press the yellow button at the bottom of remote. This will put an x next to the selected program. 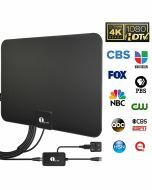 Will this work with the old box tv? not a flat screen and don’t have hdmi plug on tv. This converter box can work with the TV which doesn't have the digital tuner and HD TV. Please note that this box can't work with network or wifi. If your TV doesn't has the HDMI input, you can use the RF Out Cable or Audio L/R and Video RCA Cable to connect your TV and the ATSC Converter Box.